There is no denying that the introduction to Buttercup’s ‘Baby Love Affair’ with Eugene Havenga’s high pitched wails is a little reminiscent of First Class’ ‘Beach Baby’, however the song does not continue to follow the one that it sounds a bit like other than that it, like ‘Beach Baby’, carries on to become a high quality pop song. 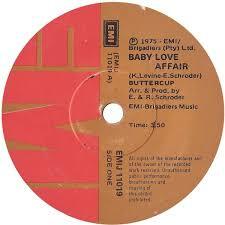 ‘Baby Love Affair’ was the first hit that the songwriting team of Ken Levine and Ernest Schroder had in South Africa as it climbed to number 7 on the Springbok Top 20. It started life during a lunch break when Ken Levine was messing around with a piano at EMI’s offices. Ernest walked in and 30 minutes later that had a ‘teeny bopper’ hit on their hands, all they needed was someone to record it. Cue Ernest’s brother Robert who was a producer. He drafted in Havenga (who would later be heard on Julian Laxton Band’s hits like ‘Blue Water’) to do the falsetto wailings and a demo of the song. However when it came to a final product, they kept the falsetto bits from Eugene and Robert drafted in a band from Pretoria that featured Lefty Daniels, Stephen Swann, Philip Colyn, John “Fluffy” de Kock and Boet Spies. At that stage Buttercup were not well known, so a marketing campaign featuring cardboard hearts that contained a lollipop and a message saying “Have you heard Buttercup sing Baby Love Affair” which was sent out to stores and DJs across the country. Peter Feldman of The Star newspaper plugged the song and the rest, as they say, is a lekker local song.